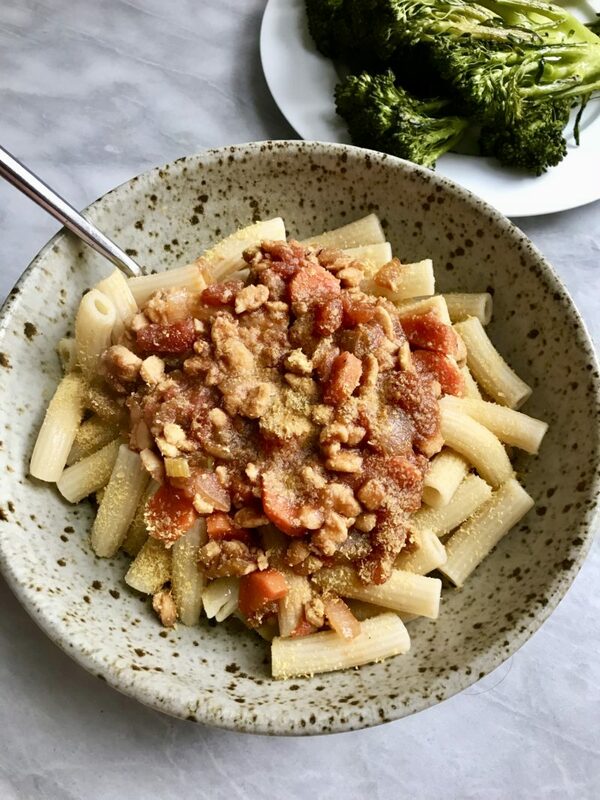 I am always down for a Vegan bolognese recipe! However, I didn’t realize until now that Tempeh makes the perfect “meat” substitute in this recipe! Not only is it packed with protein, but it adds such great flavor. Sunbasket is an organic and sustainably produce meal delivery service that include nutritionist – approved recipes. They use 100% compostable and recyclable packing, and now offer a whole bunch of Vegan recipes! Their Vegan meal plan offers a ton of different and creative recipes that are delivered right to your door that you create yourself! All of their product is organic and seasonally picked from the best farms. This is a great option if you are doing Veganuary, or are trying out Veganism for your new years resolution! Sunbasket is also great if you are short on time and have a busy schedule. 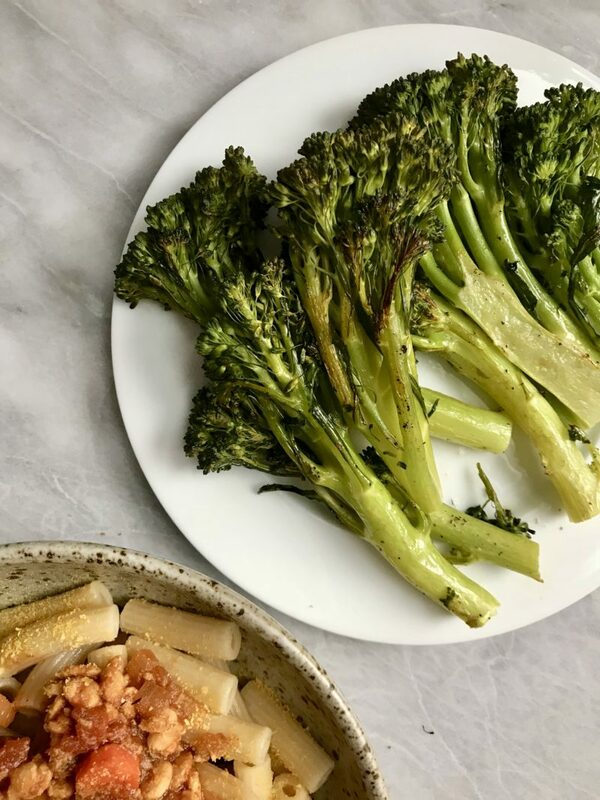 This recipe also includes baby broccoli to have on the side to add more veggies and make it that more nutritious! I hope that you enjoy this recipe! If you make it, don’t forget to tag me on Instagram @plantbasedjane. Bring a medium [large] sauce pot of generously salted water to a boil. Add the rigatoni and cook until just tender, 10 to 12 minutes. Drain, reserving 1 cup pasta cooking water. Return the rigatoni to the pot, drizzle with 1 to 2 teaspoons oil, and toss to coat. While the water heats and the rigatoni cooks, prepare the tempeh. Crumble or cut the tempeh into corn-kernel-size pieces. In a large frying pan, combine the tamari and 1 cup cold water and bring to a boil. Add the tempeh and cook over high heat, stirring occasionally, until softened, 6 to 8 minutes. Drain the tempeh and transfer to a plate. Wipe out the pan. While the tempeh cooks, prepare the baby broccoli. Trim the stem ends from the baby broccoli. On a sheet pan, toss the broccoli with 2 to 3 teaspoons oil; season with salt and pepper. Spread in an even layer and roast, turning once halfway through, until lightly browned and crisp-tender, 6 to 8 minutes. 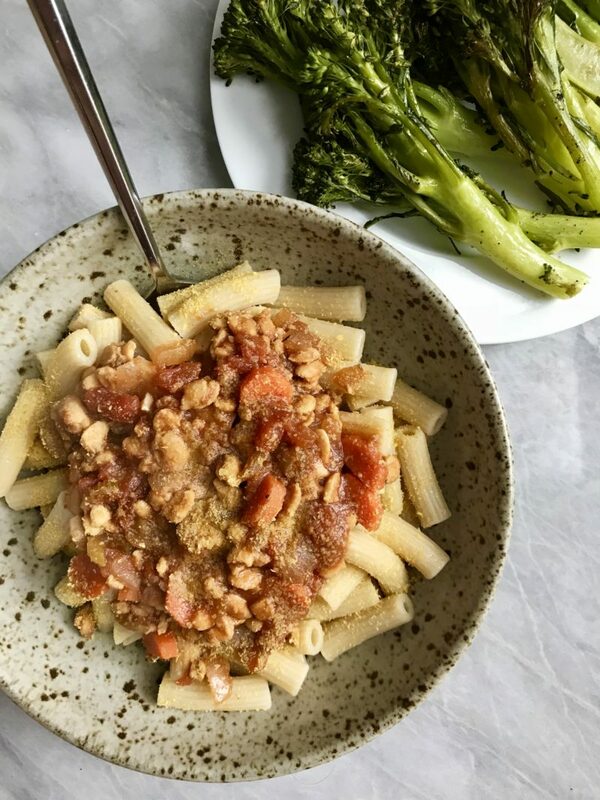 While the broccoli roasts, prepare the tempeh Bolognese. In a small bowl, season the vegan Parmesan to taste with salt. In the same pan used for the tempeh, warm 1 to 2 tablespoons oil over medium heat until hot but not smoking. Add the mirepoix, season with salt and pepper, and cook, stirring occasionally, until beginning to soften, 4 to 6 minutes. Add the tempeh and cook, stirring occasionally, until the tempeh is lightly browned and the mirepoix is softened, 3 to 5 minutes. Stir in the Bolognese spice blend, fennel seeds, diced tomatoes, tomato paste, balsamic & tsp of olive oil. Add ¾ cup reserved pasta cooking water plus ¼ cup white wine (or, if not using wine, add a total of 1 cup reserved pasta cooking water). Bring to a boil, reduce to a simmer, and cook, stirring occasionally, until slightly thickened, 3 to 5 minutes. Remove from the heat and season to taste with salt and pepper. 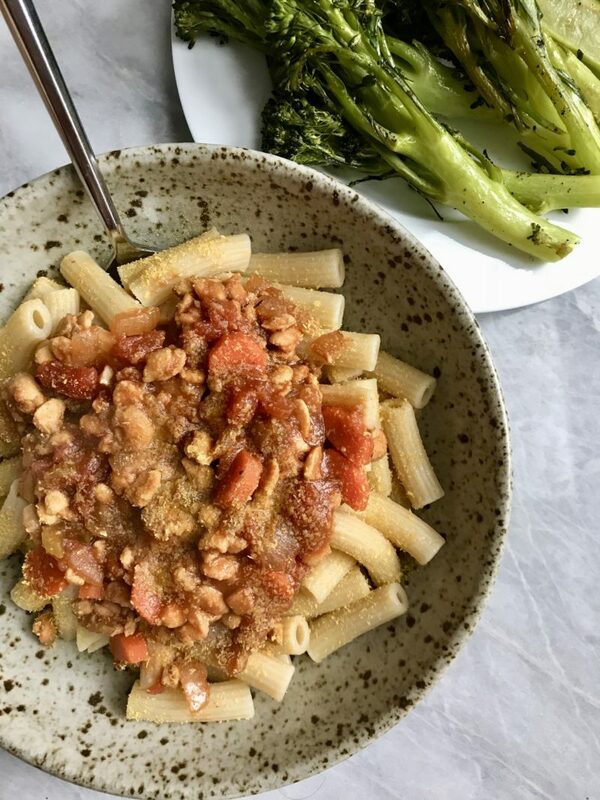 Transfer the rigatoni to individual bowls, top with the tempeh Bolognese, and sprinkle with the vegan Parmesan. Serve the broccoli on the side. Thank you to Sunbasket for sponsoring this post! I love working with brands I love and support my blog! All opinions are my own.